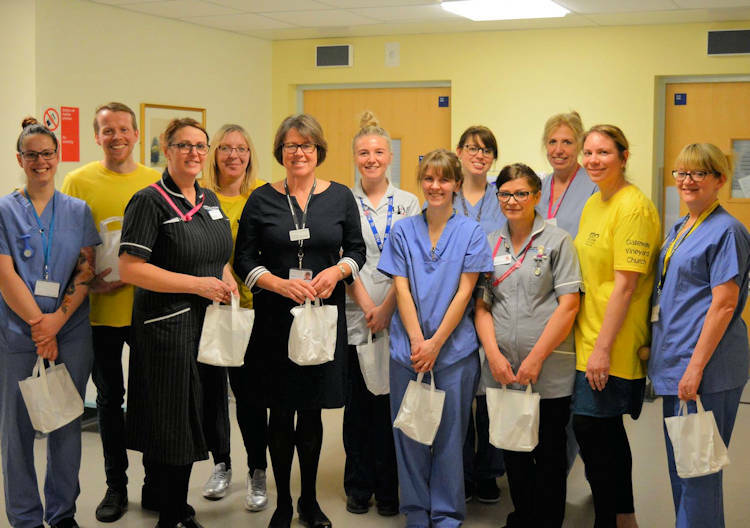 Staff at the Norfolk & Norwich University Hospital were given around 3,000 chocolate bars, fruit and snacks as tokens of appreciation for their hard work by a team from the 1000 Hours initiative at Gateway Vineyard church this week. Marc Lillystone, from Gateway, said: “Within 50 minutes of arriving on Wednesday we had run out of the first 1000 items with queues down the corridor and had to send out for more supplies from local supermarkets. “The 1000 Hours team had so much fun meeting staff, explaining briefly why we were there and handing out the gifts. We had such a great welcome and people really appreciated the thought and the chocolate. It exceeded our expectations both in terms of the amount we gave away but also the impact it seemed to have to give a small token and let people know they are valued and appreciated and that members of the public at Gateway Vineyard had donated the chocolate or money towards buying them. “We were also able to deliver the first 150 of 300 thank-you bags for midwives that groups of people had put together with some water, flapjack, lip balm and hand cream. These will be distributed to midwives at the NNUH and also in across the community,” said Marc. Rebecca Michelle posted: “Just had my chocolate bar on my lunch break! Thank you for the donations of chocolate to NHS staff! It made us smile. On Thursday a team also started delivering ward thank-you packs with tea, coffee and biscuits in as another way to thank the staff and teams caring for those who are unwell from our community and let them know they are appreciated. The grand 1000 Hours total is now touching 1400 hours – wow.